Though some of the Epicurious reviews for this recipe were negative (blandness was the most-cited fault), I luckily gave the appetizer a fair try and it won me over with flavor; Only later did I pore through the reviews that might have otherwise dissuaded me from making it. So, how to avoid blandness and make the flavor pop? The secret is in the seasoning. 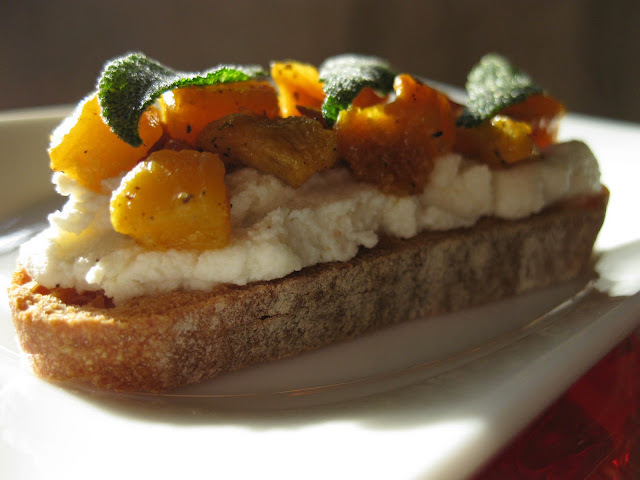 You're set up for great success with the staples: A crunchy toasted base, sweet, roasted butternut squash, and lightly salted ricotta seasoned with pepper and lemon zest. 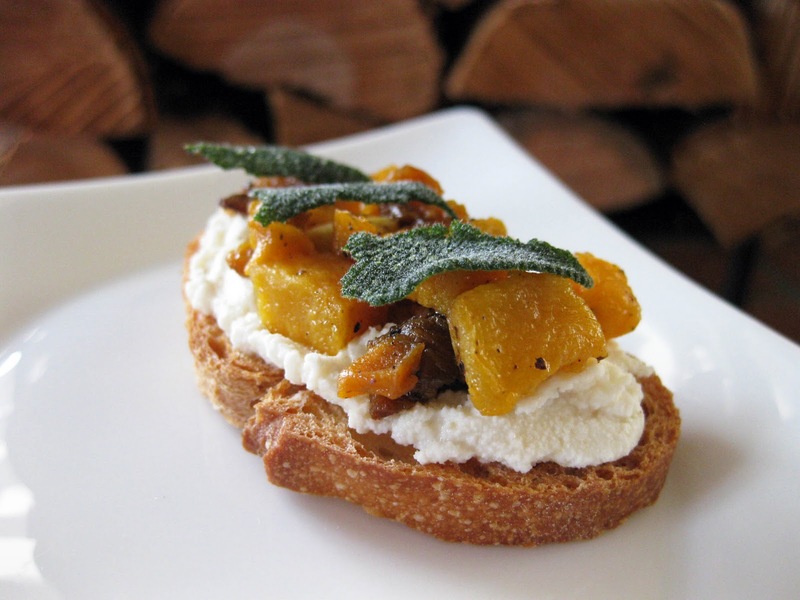 Ricotta works wonderfully as a spread, offering creamy richness, moisture, and fresh taste. The accents pull it all together: delightfully crispy fried sage leaves provide texture and aroma and a drizzle of olive oil and lemon juice give it body and acidity. To help readers season correctly, I've spelled out specifics of what you need to do - and what not to omit - in the points below and in the recipe. I've also added steps to the recipe to help you prepare more flavorful slices of toasted bread (a detail that Epicurious leaves out). Do prepare the baguette slices as mentioned below with garlic, olive oil, salt and pepper. Don't try to skimp on the sage. Fresh herbs can be expensive, but without enough of them, forget about enjoying this appetizer. There is no substitute. Goat cheese lovers might try to sub out the ricotta. Don't do it. 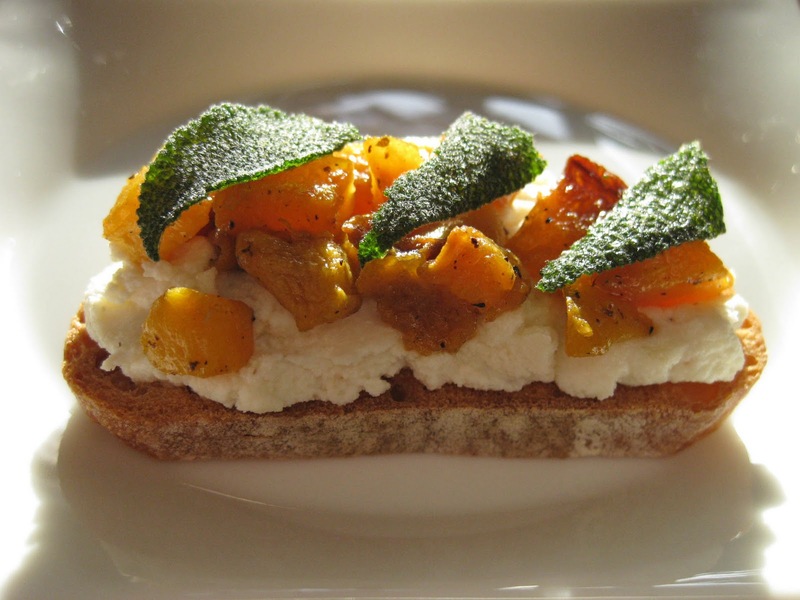 The benefit of ricotta is that its subtle flavor lets the sweetness of the squash shine through. Don't buy low fat ricotta. Fat is satisfying, so live a little. Do add enough salt and use freshly ground pepper to the ricotta and to the squash. Taste as you go until you get it right. Don't skip the drizzle of fresh lemon juice and olive oil. The acidity of the lemon juice adds punch without overwhelming, and the olive oil provides more flavor. Note: If you're thinking of omitting ingredients or modifying the recipe, please read the section above on what matters in making this recipe delicious. Preheat oven to 400°F. Mince garlic and mix with a small amount of olive oil, salt, and pepper; brush this mixture onto both sides of the baguette slices and place them on a baking sheet. Toast until golden, turning once, 5 to 10 minutes. Watch closely, as they can quickly become too dark. I ended up with more than 12 slices, but also had plenty of topping to go around. Preheat oven to 425°F. Toss squash with 2 Tbsp oil, brown sugar, salt and freshly ground pepper to taste in a large bowl. I've suggested 1/2 teaspoon each of salt and pepper as a starting point, but adjust to your own tastes. Spread evenly onto a rimmed baking sheet and roast. Turn squash occasionally, and roast until golden and tender, 25-30 minutes. In a frying pan, heat 1 1/2 Tbsp oil over medium-high heat. Add the sage leaves and cook until edges begin to curl and turn dark green, 1 to 2 minutes. Don't let them turn brown. Using tongs or a slotted spoon, transfer the leaves to to paper towels. Once they've cooled, you can cut large leaves into thirds or quarters using kitchen scissors. Don't shred the leaves and try to skimp on the sage...it's delicious, it brings the whole piece together, and each crostini should have an ample topping. Without enough of it, the appetizer's flavor is half of what it could be. Mix together the ricotta and lemon zest, and season to taste with salt and pepper. Keep adding salt and pepper, tasting the ricotta as you go, until you think "This tastes good!" If you don't season it enough, it will taste bland. 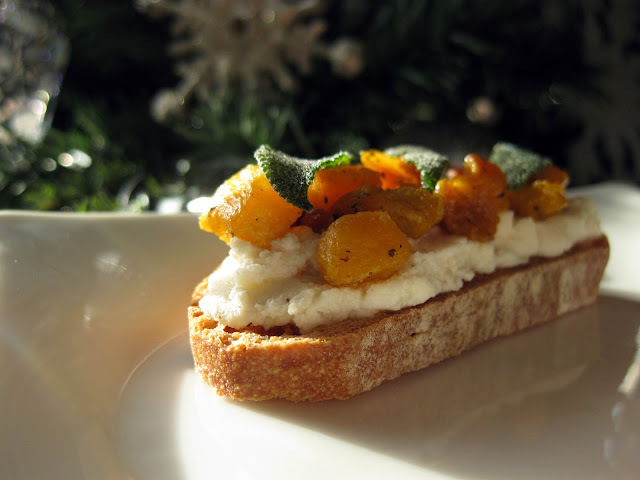 TO SERVE: Spread 1 tablespoon of ricotta on each crostini. Top each with some roasted squash. Drizzle crostini with lemon juice and olive oil. Sprinkle with salt and pepper. Top each crostini with about 2 fried sage leaves. Eat one, then add more salt and pepper if needed. If you want to make some parts of this in advance, you can prepare the butternut squash, sage leaves and ricotta one day ahead. Refrigerate the squash and ricotta; store the sage at room temperature in an airtight container. Bring the squash to room temperature before preparing the appetizers.